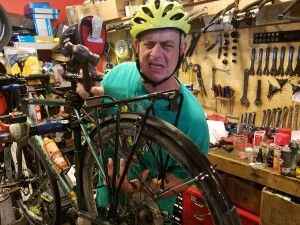 Local funny guy Jeff Kramer will be joining us on our group ride 8/31. Upstate has announced they will be giving away adult and child-sized helmets while supplies last on the FIRST annual RIDE FOR $5 DAY! Are you or your children in need of a new helmet? Is your helmet more than 3 years old, or has it sustained a crash? Upstate will be joining us during the Ride for $5 Day giving away adult- and child-sized bicycle helmets for FREE! Look for Upstate both at the start of the group ride which leaves at 9:30 a.m. at the Salt Museum at Onondaga Lake and ends at the Fair, but also by Mello Velo Bicycle Shop’s tent at the Fair by Toyota’s exhibit. “We will continue to give away the helmets that day starting at 10 a.m. at the State Fair, while supplies last,” said DiBiase. The helmet giveaway is courtesy of Upstate’s Trauma Services with additional funding from Upstate Foundation through its Friend in Deed Campaign and The Advocates for Upstate Medical University. Looking for a particular style? Visit us at the shop for a great selection of affordable helmets, including helmets from Kali Protectives which offer lifetime crash replacement!